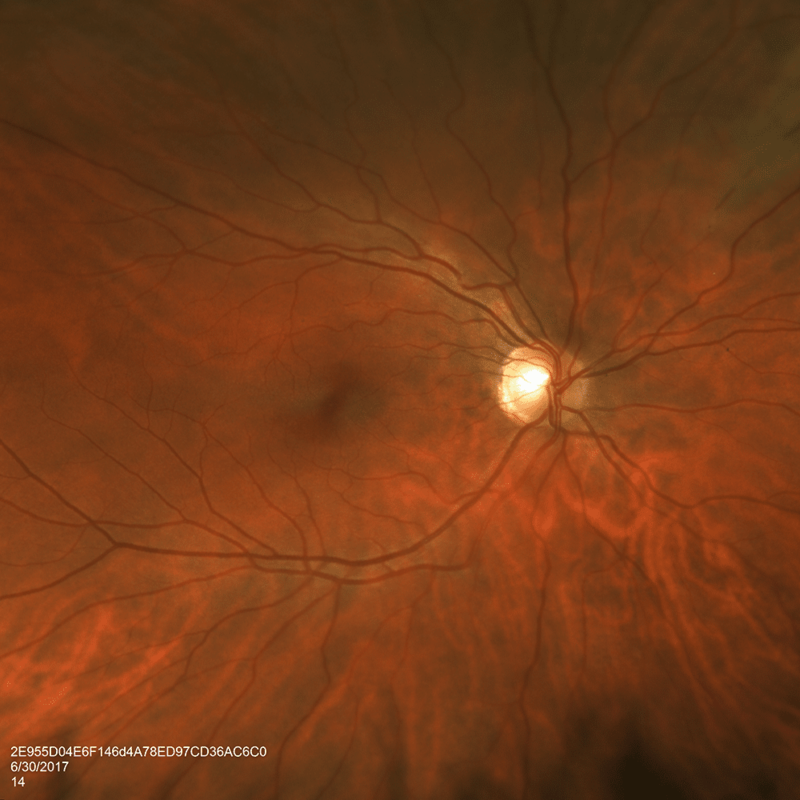 HPI: A 37-year-old Caucasian female presents, urgently referred from a community eye care provider, complaining of progressive peripheral visual loss as well as fluctuating numbness and tingling, spreading to all four extremities. Upon further questioning, she also reports intermittently diminished hearing. Past medical history is remarkable only for long-standing hypothryoidism, treated with supplementation. Past ocular history is non-contributory. Uncorrected visual acuity was 20/25 and 20/20 in the right and left eyes, respectively. Intraocular pressure was normal in both. Ocular motility, confrontational field, and pupillary examination were unremarkable, showing no relative afferent pupillary defect. Slit lamp examination of the anterior chamber was also normal, including no anterior chamber inflammation, with a clear cornea and lens in each eye. 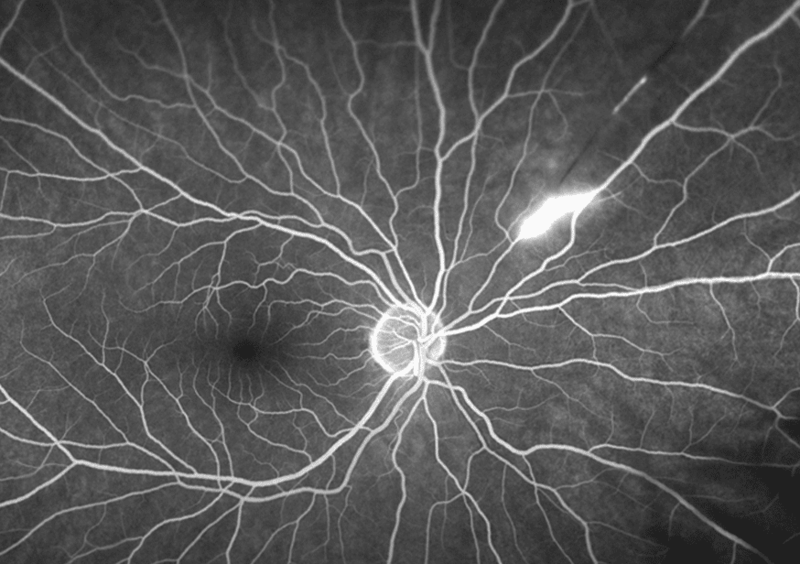 Optical coherence tomography of the involved areas showed inner retinal thickening with significant nerve fiber layer swelling, also consistent with retinal arterial ischemia (Figure 3). Fluorescein angiography of both eyes demonstrated focal late staining of the corresponding arterioles with either significantly delayed or absent filling distal to the lesions in the superonasal and inferotemproral arcade vessels in the right and left eyes, respectively (Figures 4 & 5). MRI with and without contrast of the brain demonstrated multiple hyperintense foci within the corpus callosum on FLAIR imaging, as well as generalized leptomeningeal enhancement and scattered punctate foci of cortical diffusion restriction (Figure 6). Laboratory testing, including infectious, general inflammatory and vasculitis-specific workup were subsequently negative. 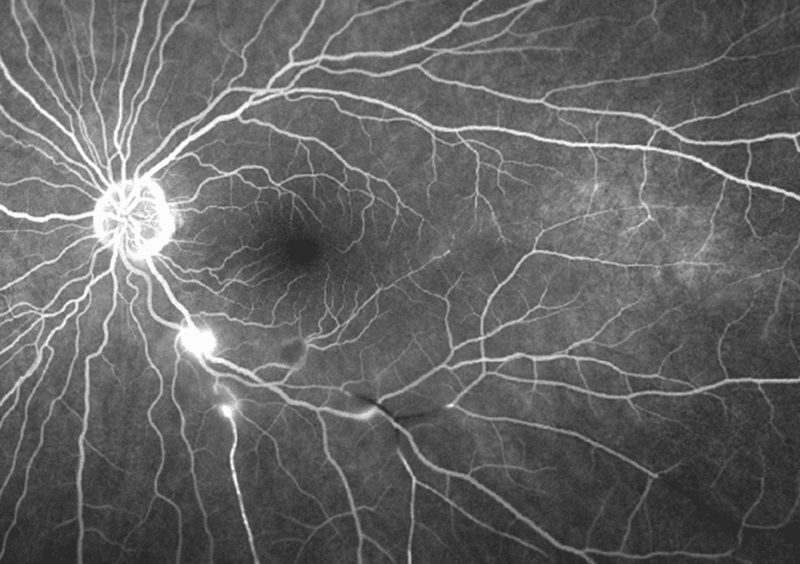 – A young, otherwise healthy female presenting with bilateral acute occlusive retinal arteritis in conjunction with neurological symptoms, particularly hearing loss is strongly suggestive of Susac’s Syndrome. 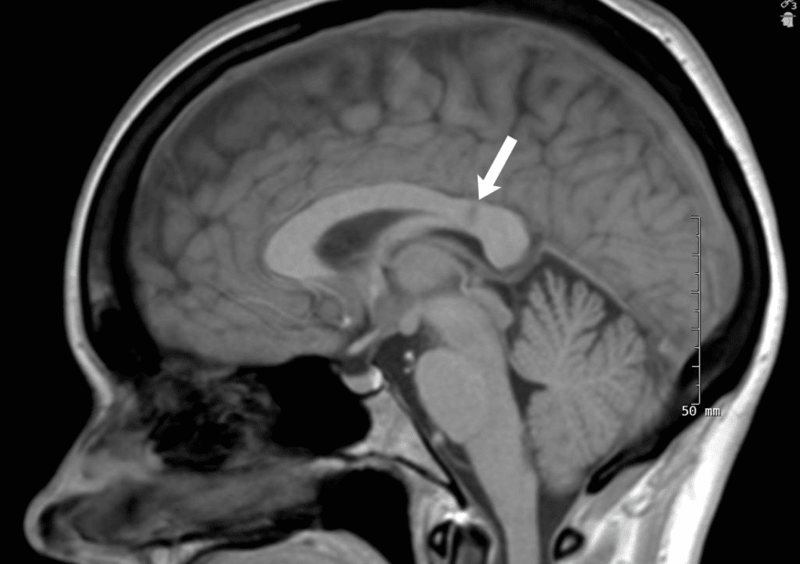 MRI findings of multiple hyperintense foci within the body of the corpus callosum are virtually pathognomonic for this condition. This, in conjunction with the negative serum testing for other infectious and inflammatory etiologies, provided sufficient basis for the diagnosis of Susac’s Syndrome. The patient was last seen 3 months after initial presentation with stable visual symptoms, intact central vision and improving neurological symptoms. Hearing remains impaired in one ear. Her treatment consists of a slow oral steroid taper, intravenous IgG twice monthly, and oral Cellcept. 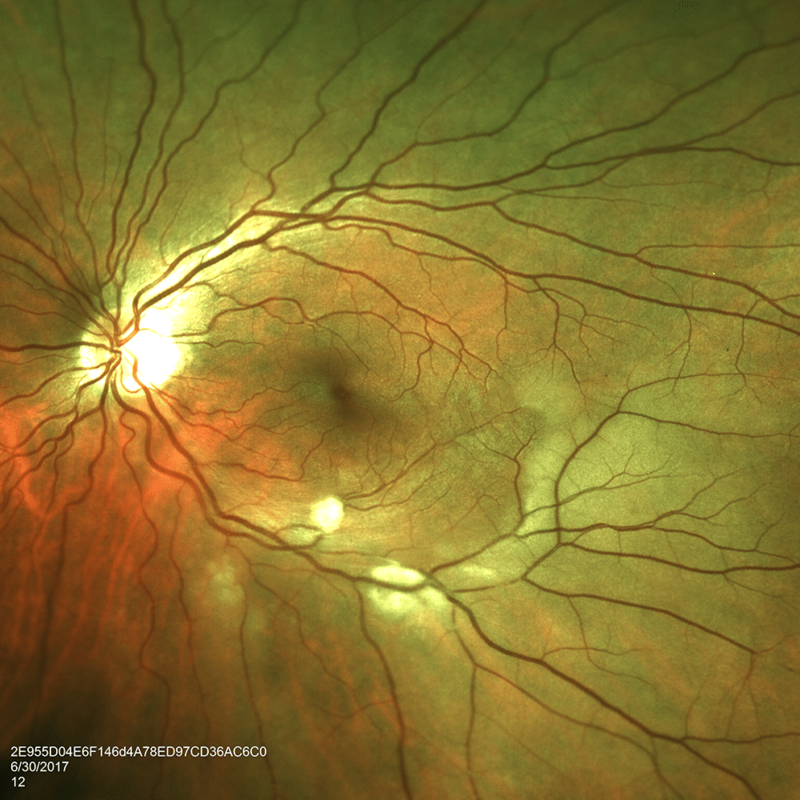 Susac’s Syndrome, also known as retinocochleocerebral vasculopathy, classically consists of a triad of encephalopathy, branch retinal artery occlusions, and hearing loss. It is an autoimmune endotheliopathy, suggesting that it is caused by autoantibodies directed against the endothelial cells of the arterioles. One or more of the “triad” symptoms may not be present or may fail to be recognized on initial presentation. Often, the encephalopathic component is accompanied or preceeded by migraine headaches. Typically, this condition is seen in young women, between 20 and 40 years of age, however it can be observed in other subsets of the population. As mentioned above, pathognomonic of Susac’s are findings of hyperintense foci within the corpus callosum on FLAIR MRI imaging, best seen in sagittal cuts, which represent small acute infarcts. Because of their appearance they are often referred to as “snowballs” or a “string of pearls”. Later, these fade to become hypointense, particularly on T1 imaging, and they are then referred to as central callosal “holes”. It is essential that Susac’s syndrome be diagnosed promptly, since if treatment is delayed it can ultimately lead to permanent disability or death. Once diagnosed, treatment consists of high-dose corticosteroids, coupled with an immunosuppressant such as Cellcept, Intravenous IgG is also helpful to gain control of the disease. Magro, c.M., Poe, J.C., Lubow, M. & Susac, J.O. (2011). Susac Syndrome: An Organ-Specific Autoimmune Endotheliopaty Syndrome Associated With Anti-Endothelial Cell Antibodies. American Journal of clinical pathology, 136(6), 903-912.